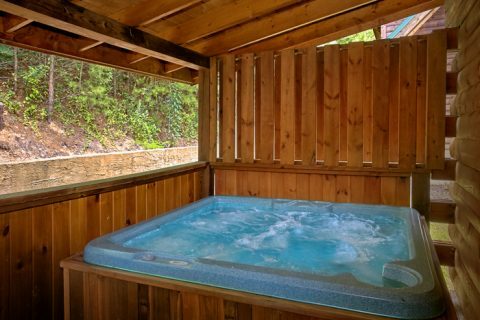 Book "A Lover's Retreat," a Smoky Mountain cabin rental with resort pool access, for a log cabin vacation complete with a heart-shaped jacuzzi, fireplace, and more! 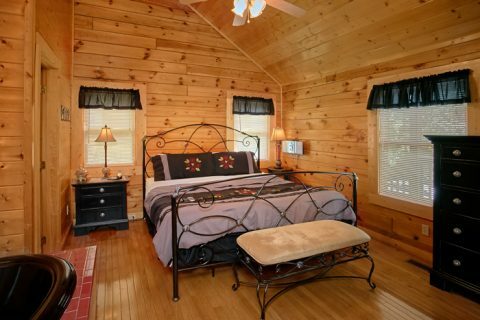 This affordable honeymoon cabin provides guests with a convenient location in Arrowhead Resort and all the features you need for a relaxing cabin retreat. "A Lover's Retreat," places guests in the heart of the area's finest attractions. 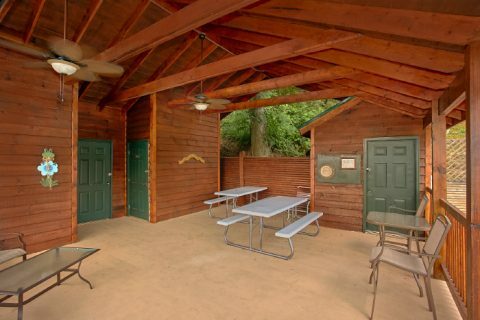 Conveniently located near Gatlinburg, Pigeon Forge, and the Great Smoky Mountains National Park, this cabin makes it easy for guests to spend their days at the outlet malls, golf courses, restaurants in the surrounding area, visit Dollywood or Ripley's Aquarium, or hike in the Great Smoky Mountains National Park. Not interested in going to town? 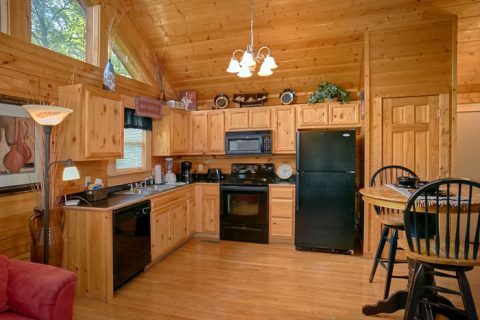 There’s plenty of features to help you relax at your cabin. 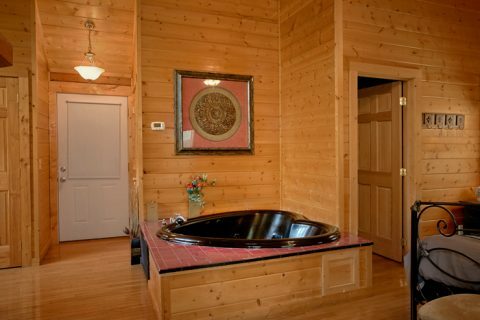 Relax in the warm waters of the jacuzzi tub or hot tub. 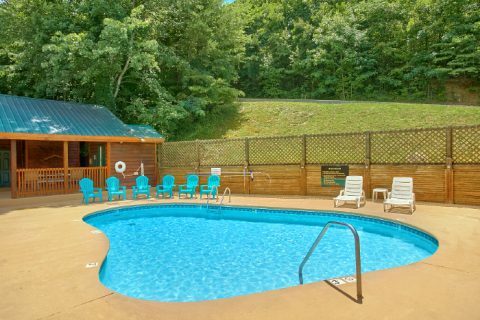 Cool off at Arrowhead resort’s pool on a hot summer day. 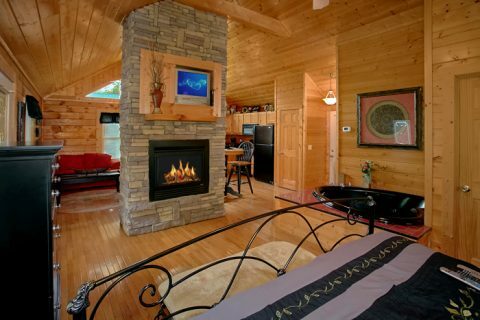 The double-sided fireplace between the living area and king bedroom provides a romantic for a laid-back evening in your Smoky Mountain honeymoon cabin. 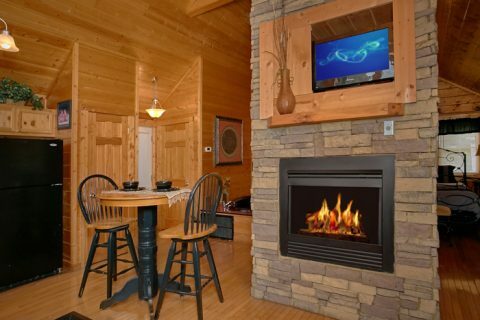 With your cabin retreat's full kitchen, you can impress your sweetheart with a delicious meal by the fireplace. 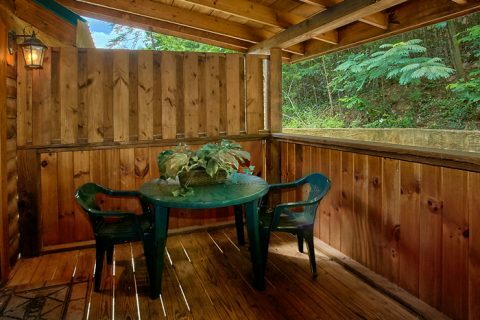 At day's end, step out onto your cabin's deck to watch the stars brightly shine in the night sky. Once it's time to get some rest, you can look forward to retiring to a spacious king size bed. An additional sofa twin bed is available in the living area. Altogether, "A Lover's Retreat" can sleep 3 guests, but it is also perfect for a romantic vacation for two! 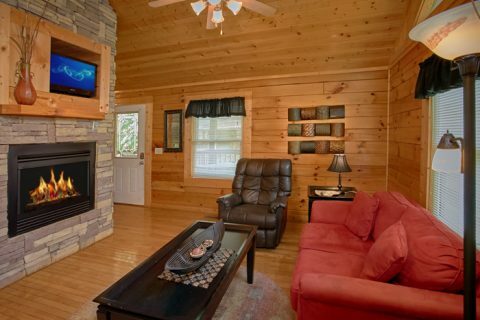 Book "A Lover's Retreat" or one of our many other 1-bedroom cabin rentals in Pigeon Forge for a couple's mountain retreat that you both will never forget! 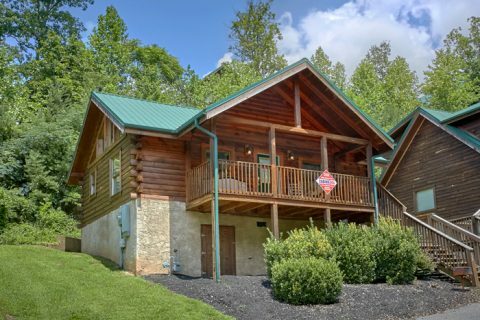 Don't forget to book with Cabins USA Gatlinburg online or by calling our office to earn a special discount on your honeymoon cabin in the Smokies! * 1 night results are limited. 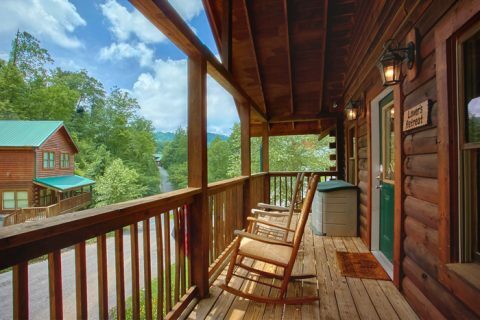 Want to receive up to date information on cabin specials and events in the Smokies? Sign up for our newsletter! Simply provide a contact name and email so that we can reach you. 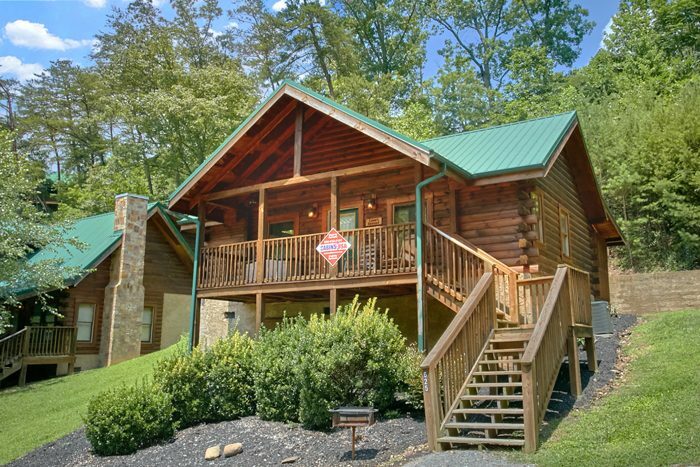 Cabins USA Gatlinburg respects our guest's privacy and never shares this information with third-party sites. We treat any information that you share as confidential. Nights: select your arrival date and enter the number of nights you plan to stay. Promo Code: If applicable - Please enter a valid code. There are several boxes that can be checked to broaden or narrow your search. Once you select your desired amenities or locations, simply click "search" to filter out available properties for your desired date. Once search results are provided, you can sort your results by bedrooms, name, rate, and rating. After your first search, it isn't necessary to click the "search" button again as this feature will automatically filter your results for any new search features you provide, unless you change the date, the number of nights, or go to a new webpage. It isn't necessary that you wait for a search to be completed before you select or deselect different search features. When browsing results, you can add them to your "favorites" by clicking the red plus mark on the bottom left of your desired property. You can view your selected properties by click the "favorites" tab at the top of the search bar. When using our "search" feature, you can make a list of favorites. After doing an availability search for your desired vacation date, our site will produce a list of available cabins. Simply click the "+" sign on the lower left side of the property you are interested in. Doing this will add the rental to your favorites list. You will notice that the "+" has now changed to a "-". You can click this minus sign to "unselect" this property from your favorites list. You can also remove a property from your favorites list by clicking the minus sign to the right of the property name under the favorites tab. Additionally, you clear your favorites list by clicking "remove all" on the favorites bar. After doing this, you will have to perform a new availability search. The number next to the favorites tab is the number of properties you have selected. To see all of your favorite rentals on one page, simply click "view list"
Under the favorites tab on the search bar, you can view your selected favorites. By checking the box next to your selected rentals, you can compare up to three properties. Simply select the 2 – 3 properties you wish to compare, then click "compare" to see these rentals side-by-side. Once you find your perfect rental for the right date, simply click "book now" to begin the booking process.